The Bergantino family – Sophie (15), Celeste (10), JR and Tamar – moved to Tucson from California 10 years ago for professional opportunities. 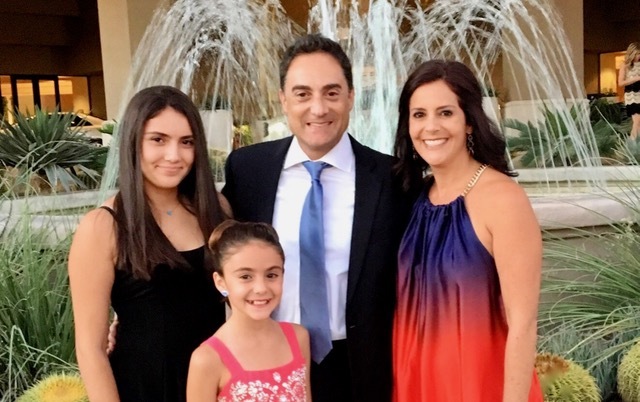 “Starting a fund at the Foundation is a good way to discover how to help those in need,” says Tamar Bergantino, who, together with her husband JR, established a Donor Advised Fund (DAF) and a Testamentary Endowment Fund at the Jewish Community Foundation. “Our DAF allows us to support nonprofits today, but what we think are important ways to give now may be different in 20 years, and may be different from what our girls are interested in as they mature. That’s where the Testamentary Endowment comes in.” By also establishing this endowment fund, the Bergantinos are ensuring that the things their family cares most about will be supported long after their lifetimes. “The Foundation gives us flexibility to refine our plans to provide donations as the need changes,” says Tamar. Tucson’s Jewish community embraced the family. Tamar grew up with Reform Judaism and JR grew up Roman Catholic. When they married and ultimately had children, they wanted their children to have a very strong religious identity and both believed the core values of Judaism would help shape their family. The Bergantinos not only found the support they needed in Tucson, but reached out to the Jewish Federation of Southern Arizona to learn more about where they could make a difference in the lives of others, both Jewish and non-Jewish, here at home and throughout the world. Tamar joined the Federation’s Young Women’s Cabinet early on, where she made many friends whose company she enjoys today. She has traveled to Israel twice with Jewish women from the community, and has co-chaired both Mitzvah Magic and the Federation’s Women’s Philanthropy Connections Brunch.